Written by Albert Beevendorp and Patriek Lesparre. when using loose files the max. cluster size is 16 kB. Larger cluster sizes need the ROM images concatenated into one 256kB file. 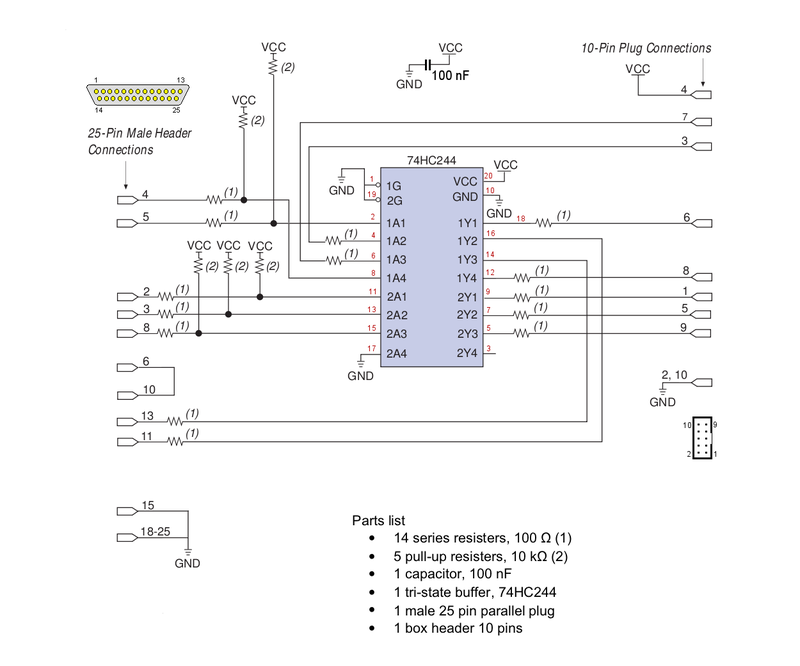 Here is a schematic for a Parallel port digital ByteBlaster II cable, provided by Edwin Velds, which can be used for this purpose. The user guide for this cable can be found here. You can get the Altera Quartus II Programmer software here. - MSX System ROMs in Intel Hex format. - This file contains configuration data for the FPGA, the compiled VHDL code. Simply put, this is the MSX system. NOTE: This file is slightly newer than the factory default FPGA contents. - MSX-DOS2 system files for FAT16. - A floppy disk emulator, to use disk images as if real disks. - Writes a disk image to a real disk. - Creates a disk image from a real disk. - A disk copy program. - Load a ROM image into the ESE-SCC/RAM. - Creates a ROM image from a real cartridge. - Load a .pld configuration file into the ESE3 FPGA. - Save the current configuration of the ESE3 FPGA. For compiling and synthesizing the VHDL source code you will need Altera's Quartus II Web Edition software. Version 8.0 has been reported to have problems, so please download version 7 here. Using DIP switch 5, the Mega-SD support can be switched on or off. It has support to emulate a floppy disk drive with a disk switch option. An extra table is kept with room for up to 16 disk images. A disk image can be connected to a drive letter, so it's possible to access the disk image as if it was a real diskette. To use the feature there's a tool available on the CD-ROM called EP.COM. It's located in the TOOLS\DiskImage directory. EP.COM adds a disk image to the table and either connects it to a drive letter for direct use or prepares it for a multi-disk use. Disk images can be made read-only when adding it to the list. Remember to keep a game's user disk write enabled. Connect DOCUMENT.DSK to driveletter B: and make it read-only (with /W). When there's already a disk image connected to it, there will be an error and it won't be connected. Connect TOOLS.DSK to driveletter B:. When there's already a disk image connected to it, it'll be disconnected (with /F) before it's connected. The disk image is added to the table and set as boot disk (with /B) and the system will reboot using the disk emulator (with /R) to boot the disk. First an existing table is cleared (with /D) and the disk image is added and set as boot disk. The disk image is added to the table. The number behind the /B option is written in hexadecimal notation. It corresponds with the number or letter printed before the colon. The table is cleared and the user disk image is added. The disk image is added to the table, set to read-only (with /W) and set as boot disk. The disk image is added to the table and set to read-only. The disk images must be unfragmented on the disk to work. This will be checked by EP just before it's added to the table. Using DIP switches 7 and 8 the function of slot 2 can be selected. Setting them up to both off, the second cartridge slot is available (to access through slot), otherwise one of the ESE-RAM or ESE3-SCC is enabled in slot 2. When one of those devices are enabled, there is 512 kB RAM extra which is mapped by the device selected. This can be the SCC, ASCII 8kB or ASCII 16kB. The RAM can be used to load MegaROM files. For this there's a tool available on the CD-ROM called MGLOAD.COM. It's archived in BU951030.LZH which is located in the TOOLS\DiskImage\reference directory. Set up the ESE-RAM ASCII 16 kB mode (DIP 7 on, DIP 8 on). Set up the ESE-RAM ASCII 8 kB mode (DIP 7 on, DIP 8 off). Set up the ESE3-SCC mode (DIP 7 off, DIP 8 on). The /S02 refers to the slot of the ESE-RAM. It's possible to play non MegaROM titles with the device as well. ESE3-SCC is best suited to run those titles. As MGLOAD doesn't restore mapper banks to the initial state, a reset of the ESE3 after loading is required to start it. Alternatively, you can use ROMLOAD for ROM images in SCC mode. © by Patriek Lesparre. Hosted by The New Image.